Celebrating a decade of academic conferences, ARCA will host its 10th summer interdisciplinary art crime conference the weekend of June 21-23, 2019. Known as the Amelia Conference, the Association's weekend-long event aims to facilitate a critical appraisal of art crimes and the protection of art and cultural heritage and brings together researchers and academics, police, and individuals from many of the allied professions that interact with the art market, coming together to discuss issues of common concern. 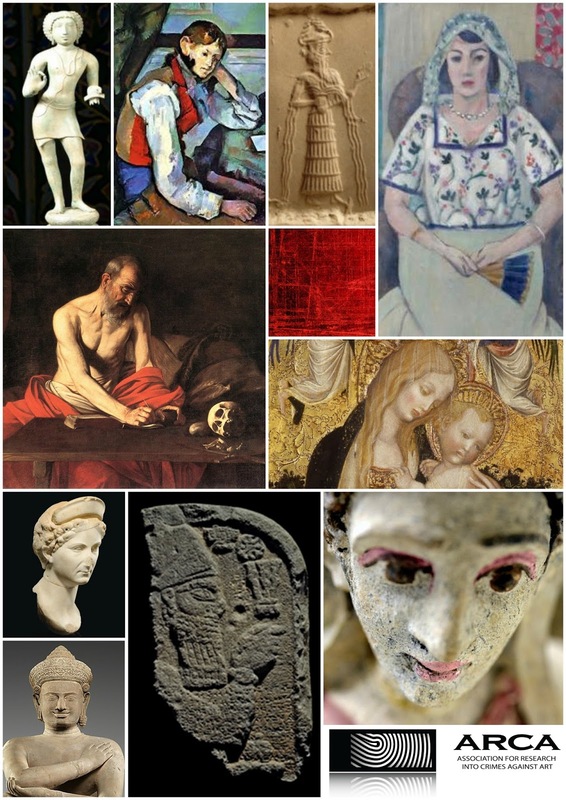 In celebration of its 10th anniversary, ARCA will host its annual summer interdisciplinary art crime conference the weekend of June 22nd through June 24th this summer. For more details on this event please watch the conference information page on the ARCA website where you can register and where a list of accepted speakers will be posted by April 07, 2018. Luca Del Moro, an officer with the carabinieri office in Amelia, was stationed in Uganda from 2004 to 2008 — however, the hard work of Italian Catholic missionaries in this land-locked African country left an impression on him. Del More is CEO and Founder of ICAD Onlus - International Cooperation and Development Association. This September, Del Moro will be leading the third course on security and volunteering. The course on security in countries plagued by terrorism will be held for teachers from the United Nations, universities, armies, police, and missionaries. The subjects include radio communication; personal security (working with interpreters; negotiation and communication; security risk assessment; survival skills; weapons awareness; basic first aid; basic self defence; four-wheel drive vehicles (driving, maintenance and map reading); travel, convoy and vehicle security; and Italian Embassy and crisis unit; background, history and cultural awareness; stress management; and making photo reports and interviews. 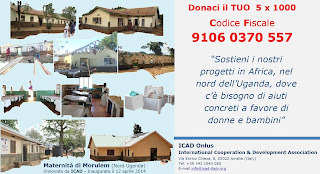 In July, Ambassador Grace Akello, Head of the Diplomatic Mission of Uganda to Rome, wrote a letter to ICAD expressing her gratitude for the organization’s participation in a promotional event for Uganda’s role at Milan EXPO held on April 27 in Rome. My colleague Ambassadors who came to the promotional events, appreciated how your organization is helping to building practical capacities in all the areas that you are working in. This means that if ever you were to decide to move out, the people left behind would continue as normal and would not be left bereft of knowledge. Secondly, my colleagues appreciated your statement that you did not go there to change people. They saw this as expressing the right to people to manage their own lives, with your technical input, that also passes on the soft and hard technology. This way people learn from you and make their own choices on how they want to utilize this knowledge in their own communities. This is what partnership is made of. Allow me to take this opportunity to assure you of my highest esteem. You can find out more information about ICAD through Facebook, searching under Luca Del Moro (http://www.facebook.com/luca.delmoro.33/), or ICAD Onlus (http://www.facebook.com/ICAD.org/). Another Amelia resident, Giulia Spernanzoni, a university student studying security, traveled with ICAD Onlus to the northern part of Uganda (Karamoja) in February to follow different project and inspect the clinic which will be supplied by “tools and medicines for the benefit of the IK tribe gatherers and hunters” (ICAD). Ms. Spernanzoni is also a member of the ICAD board. 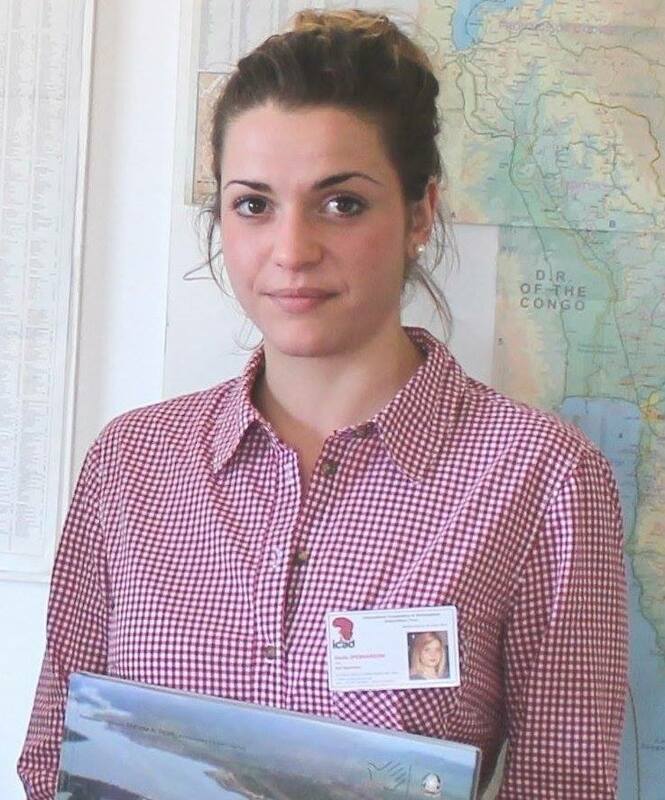 She attended the 2nd Course for Humanitarian Operators, completing both phases in Italy and in Uganda. ICAD has focused is efforts to help new mothers and their children at a maternity center in northern Uganda. A more modern facility opened in April 2014, but ICAD is working to raise funds for other structures such as the kitchen, the toilettes, and sleeping areas. One of the founding members and board members in charge of ICAD, Msgr. Sandro Bigi, passed away in the middle of June, his funeral at the Duomo in Amelia closed down the town as everyone turned out to remember “his big heart and his dedication in helping his neighbors” (ICAD). 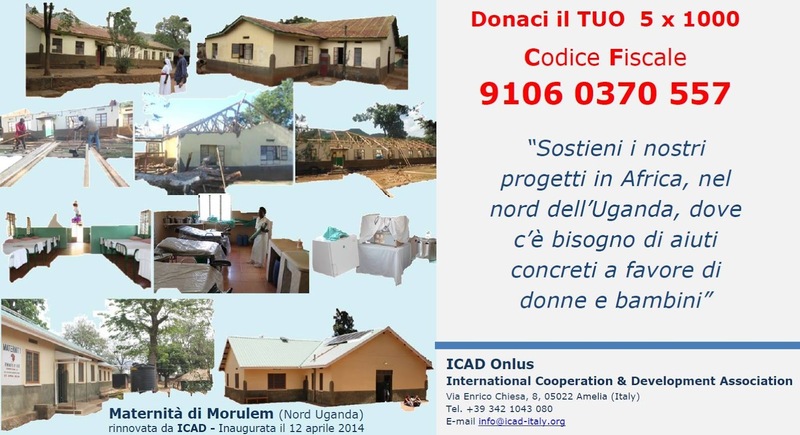 In June at the Parish of Saint Maria Maddalena of Torre Angela in Rome, ICAD held a charity dinner to raise funds needed to building a small house for the pregnant women living near the Morulem Maternity Centre (Uganda). Next September, during the last two weekends (19-20 and 26-27) there will be the 3rd Intensive Course for Humanitarian Operators - Safe & Secure approaches in Field Environments. The cost is 250 euros, included the application and accommodation. The location is the gorgeous “La Tenuta dei Ciclamini” (www.iciclamini.it/) in Avigliano Umbro, owned by the famous Mogol. For more information write at info@icad-italy.org. The Association for Research into Crimes against Art (ARCA) will be hosting its 7th annual interdisciplinary Art Crime conference in Amelia, Italy the weekend of June 26-28, 2015. 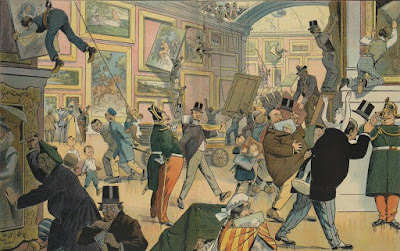 Providing an arena for intellectual and professional exchange, this annual art crime conference highlights the nonprofit’s mission and serves as a forum that aims to facilitate a critical appraisal of the protection of art and heritage worldwide. Bringing together international scholars, law enforcement experts, art professionals, the general public and participants in ARCA’s postgraduate certificate program in Art Crime and Cultural Heritage Protection, attendees will have the opportunity to examine contemporary issues of common concern in this important field. 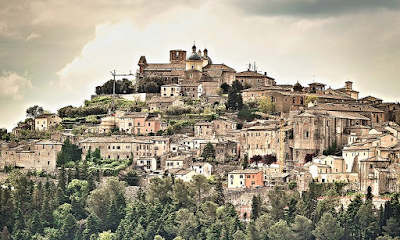 Held in the beautiful town of Amelia (Umbria), the seat of ARCA’s Postgraduate Certificate Program in Art Crime and Cultural Heritage Protection. The conference will include multidisciplinary panel sessions, key note speakers, a Friday evening ice-breaker cocktail reception and an awards dinner on Saturday evening — honoring the 2015 recipients of ARCA’s annual award for outstanding scholarship and professional dedication to the protection and recovery of cultural heritage. This events opens with an optional icebreaker cocktail on Friday, June 26th at the Palazzo Farrattini. 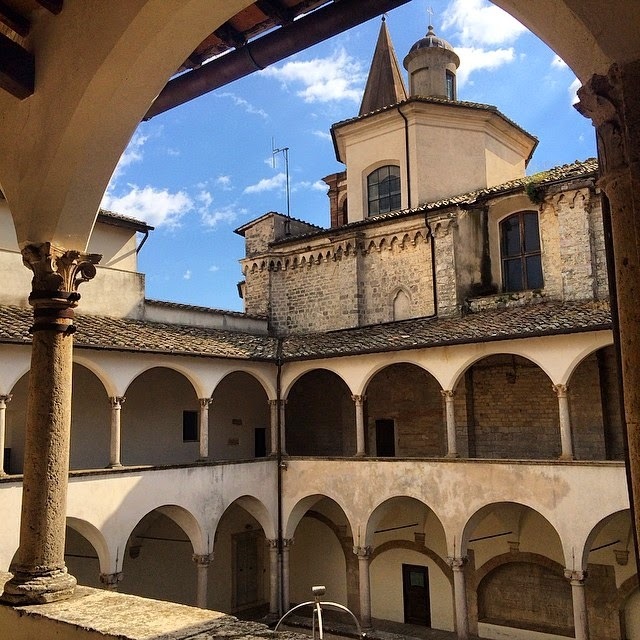 For the first time in the conference's history the event will cover two full days of speakers from Saturday, June 27 and Sunday, June 28, 2015 at the Sala Boccarini, inside the cloister of the Biblioteca Comunale L.Lama adjacent to the Museo Civico Archeologico e Pinacoteca “Edilberto Rosa” in Amelia, Italy. Sessions begin promptly at 9:00 am, with breaks for coffee and optional Saturday and Sunday lunches as well as an optional Italian slow food dinner Saturday evening. The 2015 conference is open to the public and all are welcome to attend. Registration for the conference is $75 for Saturday’s sessions and $25 for Sunday’s sessions. To reserve a placement for the each day’s speaking sessions, please register at the event’s Eventbrite page here. Fees for optional networking meals and activities are payable at registration check-in at the venue. Once registered, attendees will receive an email in March with information on directions to and lodging in Amelia as well as further details on the costs for the optional networking events planned. The list of 2015 award nominees will be posted to the ARCA blog later this week. “So How Did We Get Here? Trying to Understand the Reasons Behind the Unprecedented Destruction of Archaeological Heritage"
“EU = 28 Countries + 28 Legislations = 1 Million Problems"
“Dealer Conversion of Consigned Art: When Drugs and Greed Make the Art Disappear"
“A Collection of Thefts: What One Museum's Responses to Five Incidents Can Teach Us About Ideal Resolution"
“Sentencing the Art Thief: Deterrence, Responsibility, Protection, Reparation and Restoration - Uneasy Bedfellows in a Courtroom?" (please watch this space as a few key speakers are still confirming their travel and presentation titles). FORTE CESARE: lost, forgotten and hopefully found? Italy is famous all over the world for its rich and varied material heritage, some of it well-preserved as historical sites of interest or kept safe in rich museums located all over the country; other parts of it sadly neglected. The abundance of historical, artistic and architectonic elements has always posed a problem of conservation, and there are additional issues such as limited resources and governance. At the municipal level, a lack of clear and enforceable guidelines often contributes to the problem, ambiguity leading to art crimes such as theft, vandalism or destruction brought about by natural events such as floods or earthquakes. Forte Cesare had always been in private hands until the beginning of the 20th century, when it was added to the assets of the Municipality of Amelia. Recently, the Municipality sold Forte Cesare to a private company with plans to restore and use it. Forte Cesare is the name given to a group of ancient buildings located on the top of a strategic hill dominating all the territories around it in the center of Umbria, the green heart of Italy. 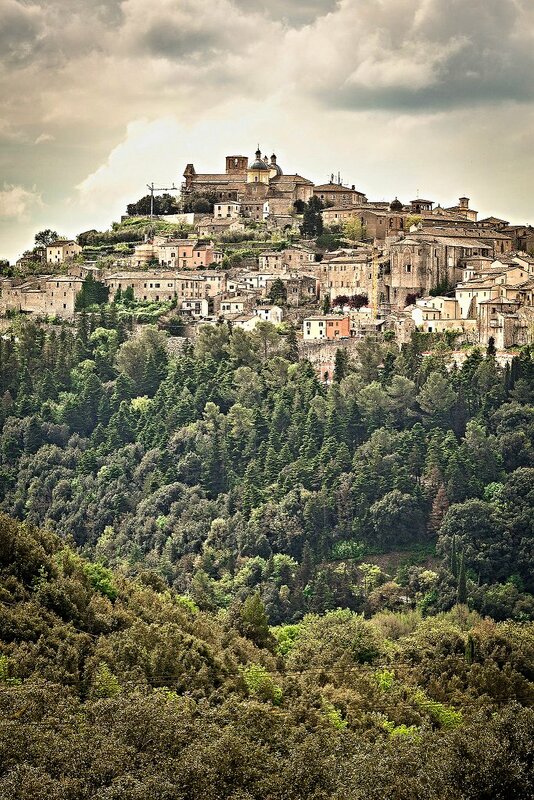 Administratively, the site belongs to the Municipality of Montecastrilli, province of Terni, which is 30 km east of Orvieto, 20 km south of Todi, 12 km north of Amelia and 85 km north of Rome. 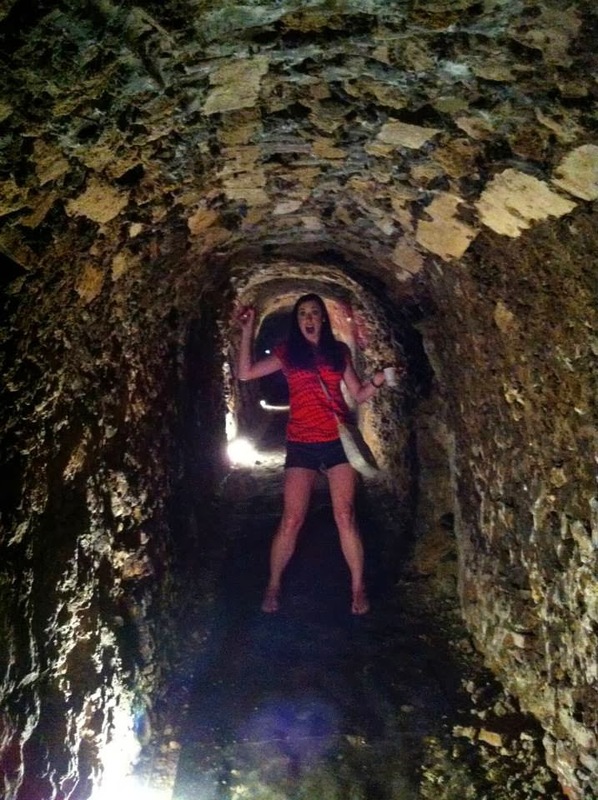 The site was probably inhabited by the Romans, but the basements of the buildings we see today date back to the VI – VII century AD, when a fortified garrison was established along the path of the Via Amerina, the most important road of the Byzantine Corridor. One century after the end of the Roman Empire, Ravenna became the capital of the Byzanthine Exarchate (a sort of province of Constantinople's Eastern Roman Empire) which included Rome. The rest of Italy was invaded by different national groups coming from the north of Europe. The only safe link between Rome and Ravenna was a little strip of land surrounded by territories occupied by the Lombards, with Tuscany to the west and Spoleto and Marche to the east; it was extended from Via Cassia, a few kilometers north of Rome, and reached Via Flaminia, a few kilometers south of Ravenna. Byzantine Corridor was the name given to the strip, and the road was called Via Amerina, touching the towns of Orte, Amelia, Todi and Perugia. At that time Forte Cesare was a fortified site with soldiers protecting people and goods traveling on both directions, but it was also a station to have a rest, change horses, and stop for the night. Later on this area became part of Terre Arnolfe (lands under the control of the Archbishop of Spoleto, 10th – 11th century), but no official documents survive until the beginning of the 16th century, when it was sold by the Stefanucci family to the Atti family, a strong Guelph family ruling in Viterbo and originally from Todi. Between the 16th and 17th centuries, Forte Cesare was radically transformed from a military to a residential complex. Only the tower remained in its original dominant position, while all the other fortified parts were reunited in the new three-story villa. Until that time, we find the toponym indicated as "Peroccolo", particularly on some maps made in the Vatican in the 19th century but stating the situation in the 13th century. The first time we find it named in relation to a “Cesare” in an official document is on a 1629 map; it probably comes from Cesare Borgia, a leader supporting the Roman Church in the wars between the Guelphs and the Ghibellines in the 15th century, who probably used the place during his military campaigns. This is one of the most credible hypotheses about the origin of the name we still use today. At the end of the eighteenth century, Forte Cesare was donated by the Bishop Franceso Atti to Propaganda Fide, an organization created by the Pope to support the missionaries’ activities and some “related” ventures, including real estate management. Propaganda Fide immediately rented it out to the Verchiani family, and few years later (1808) sold it to Ciatti family. Angelo Ciatti was the last member of this family; at his death, in 1922, he decided to donate the whole estate to the Municipality of Amelia. From the beginning, the ownership of the estate by the Municipality of Amelia was problematic. Angelo Ciatti made provisions for the revenues from the estate to establish a permanent scholarship for poor families and to improve the Boccarini Boarding School in Amelia, and to support local education and charity in general. The college was run by the Franciscans and, since 1932, by the Salesian Fathers, and it was the most important school not only for Amelia, but for all the small villages and town in a range of several kilometers. According to Angelo Ciatti’s philanthropic wishes, Amelia was becoming an educational centre for the whole rural district; other towns with relevant school institutions were too far (Todi, Orvieto and Terni). Two problems emerged following Ciatti’s wishes according his will: first of all, strong opposition from some distant relatives created some legal and administrative challenges after the estate became part of the Municipality of Amelia. Second, two different municipalities were involved in the same property, though in different roles and positions: Amelia was the legal and formal owner, but Forte Cesare is situated in the territory governed by Montecastrilli. Although this dualism seemed to exist without producing any problems in the first decades, it probably created the foundation for later situations of uncertainty, reciprocal discharge of responsibilities and apparent lack of initiative as to the property's care. After World War II, lands and buildings were rented to farmers, and later on to the Molino Cooperativo, a cooperative firm managing farming and milling activities, originally related to the cereal crops produced in the area. Particularly after the earthquake of July 30, 1978, the condition of the abandoned buildings deteriorated heavily. Both lands and buildings fell into a slow but inexorable decline, due to theft and decay soon after. Before the end of the 20th century, the asset had turned into a burden for the mayor’s budget. The P.I.M. projects were not funded, nor realized. This is the only documented project, made by the Municipality of Amelia, where a rough vision of an integrated solution is sketched, putting together “lands and buildings”. However, the proposed solutions contained a significant flaw: the cultural, historical and aesthetic value of the site was completely missing from the analysis, and consequently, twenty years after the P.I.M. 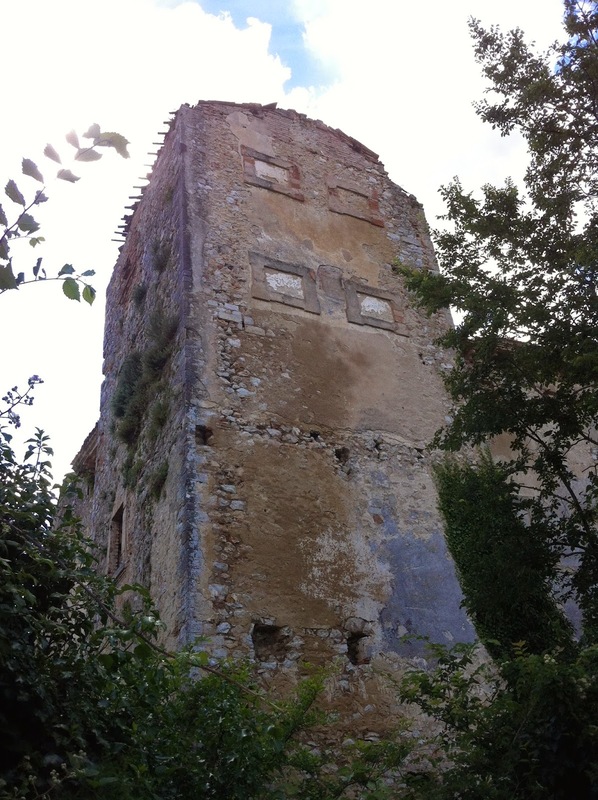 draft project, a muddling through approach caused Forte Cesare – its condition further damaged and abandoned - to be sold to a private company. 1) The main villa, surrounded by 4 minor buildings, cisterns (this is important because the area is rich of water generally speaking, but not the hill where Forte Cesare was built), a big garden and vineyard surrounded by a wall; 2) the Chapel; 3) Water springs; 4) Croplands; 5) Grasslands; 6) Woods and copses; and 7) Orchards, including chestnut, wine, olive and more. a) Holy vessels, not better specified; b) Furniture, furnishing and fittings; c) Paintings (not specified in number, position, artist and age); d) Other “non social” rural tools (that probably means that, at that time, part of the implements for farming were collectively owned or used, whilst others were individually owned; customs from the Middle Ages still ruled the relationship between landlord and farmers); and e) Cattle and crops. This list seems to be the only inventory ever made on Forte Cesare’s assets and real estates, a fact that makes its importance profound. The new owner has been working since the acquisition to on a project of restoration of the buildings and economic exploitation of the area. The project has not been approved by the Authorities yet. 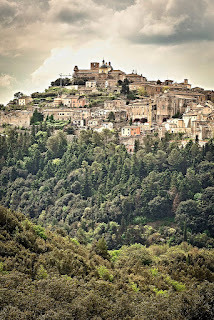 The Municipality of Montecastrilli, the Province of Terni, the Region of Umbria and Soprintendenza Beni Ambientali, Architettonici, Artistici e Storici of Perugia are involved. The idea is to create a resort, turning the main building into a five star luxury hotel and restaurant; an 18-hole golf course and a spa will be created as part of the recreational facilities, sport and entertainment components of the resort concept. The project is ambitious and far-seeing, but far from the original heritage. Luca Antonini originally wrote an academic paper under the same title for ARCA's Program in November 2012. Susan Douglas served as editor for adapting this piece for the ARCA blog. Luca Antonini graduated from ARCA program in 2012/3 and has a degree in economics from the University of Torino. Since the middle of the 90's, he has been working as project manager in local and sustainable development projects co-funded by the European Union. He specializes in managing non-government organizations (NGOs).